It feels like Spring to me, well it did when I wrote this! So I got my little spring fix. I have started organizing the house. I got the closet I wanted for Christmas (minus the door being installed) and got everything all organized in there. I started going through the kids (and mine and hubby’s clothes) and have some more donations to take in. So to me it’s spring. So lets get organized! It’s the perfect time to organize my kitchen too. We usually have to organize the pantry every 3 months as we just don’t keep it organized like we should. We have 2 kids, and well, I am not the perfect organizer either. Yes, even I fail! I got super excited with my Tupperware Modular mate samples arrived to share with my hostesses and her guests. They are 40% off right now through Jan 27th)! I know! It’s exciting. They recently came out with BLACK lids in addition to the blue and red they currently have. So this is great for those who have had black lids in the past. We basically have a closet, that has shelves on the back wall. This is not a great pantry, lots of wasted space so I have to keep things organized, and revisit it, often to keep it that way. The modular mates are great for storing your pantry staples and I have a handy chart that helps you select which ones would best suit your needs. I love the rectangles. They hold the most. If you don’t have deep enough shelves, squares are what you should use as they are shorter. And if you don’t have a lot of width, but lots of height, the ovals and super ovals would work for you. So what are you waiting for! Go pick out your favorites and order them to get your kitchen organized. And Modular Mates are not just for kitchens. 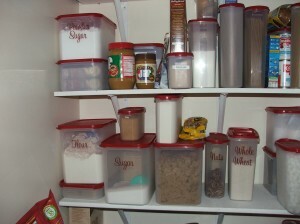 I used them to organize my unuser friendly cabinet in there as well. We also take them on trips with us (the Rectangle 4) so our chips don’t get squished when they are under the kids feet. Thanks Julie! It does feel good to take a piece of your house/life off the check list when you organize it! Thanks for stopping buy April! 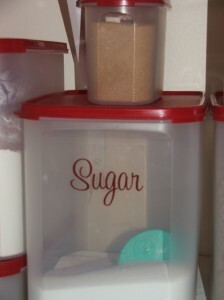 I love using these containers for cereal and snacks! Thanks for stopping by my blog! Following you back! Hope you’re having a great day! New g+ follower via hop. Those containers are pretty cool. I love all the sizes they come in, especially the skinny and tall. lol. Thanks for stopping by. Sounds like you have a busy house! I need to o the pantry. I get it nice and then some bozo ( man in the house) mixes it all up because they think if they dig deep enough they will find junk food. Love the look of the tupperware. Thanks Pam. I have to admit I mess it up when I’m in a hurry too. 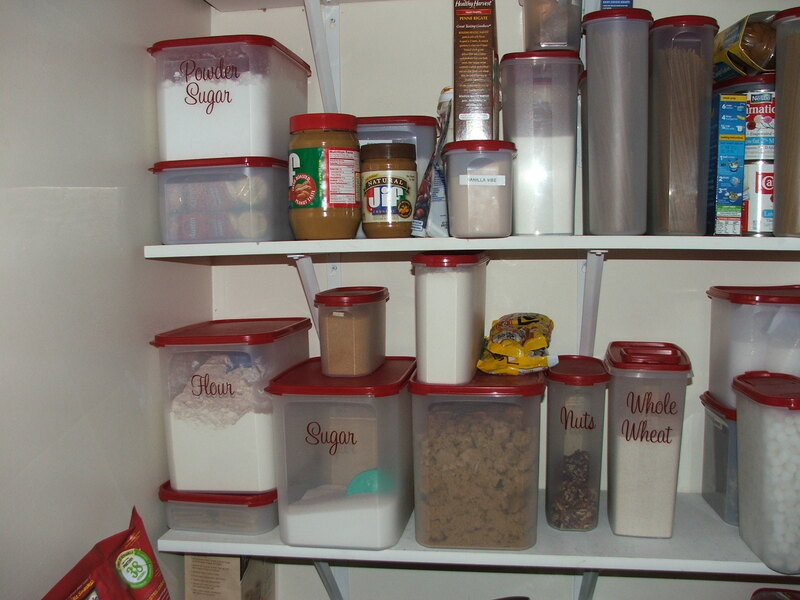 Part of our problem is how our pantry is designed and the other part is the people who use it. Good for you for getting a jump on your organizing!! I have to do this in every one of our closets! I love how you did your cabinets! I need major organizing help so I’m glad I’m now following you here and on FB!! Take care!! We have closet organizers in all but 2 of our closets. And our master is a walk in so it needa major work. Thanks for following! Looks amazing! Found you via vB and am following! I love things organized, lol, but the kitchen is my kryptonite. I struggle there to keep everything in it’s place. This id so helpful, thanks for sharing. What a cute and simple idea. I wish I had a pantry, but I’m sure it would work anywhere. Even if you stored them on your counter and labled them. Or put them in your cupboard, it would work too! What would we do without tupperware right? I love them and they are the best when it comes to organizing! Thanks for the kind words Anne. I love those labels. I too have been rearranging and organizing. Thanks for coming to our last party. I will be having parties nearly everyday so you are welcome anytime. I love the labels too1! Makes things look fancy and like you have things organized, even when the kids tear the pantry apart. Thanks for the invite too! Enjoy your sites tips and info.